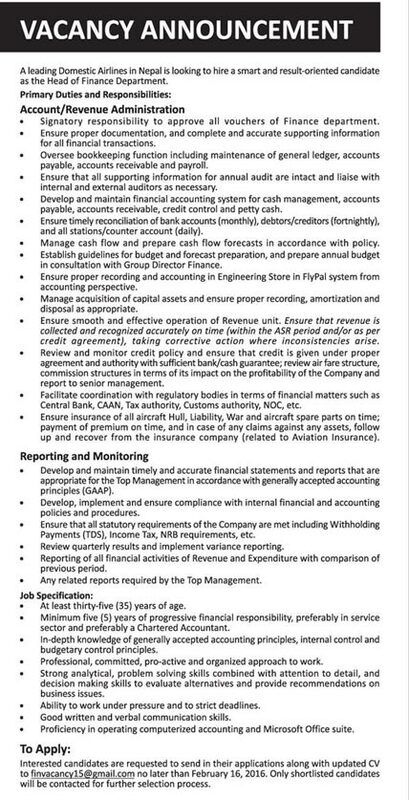 A leading Domestic Airlines in Nepal is looking to hire a smart and result-oriented candidate as the Head of Finance Department. > At least thirty five (35) years of age. > In-depth knowledge of generally accepted accounting principles, internal control and budgetary control principles. > Professional, committed, pro-active and organized approach to work. > Strong analytical, problem solving skills combined with attention to detail, and decision making skills to evaluate alternatives and provide recommendations on business issues. > Ability to work under pressure and to strict deadlines. > Proficiency in operating computerized accounting and Microsoft Office suits.